I thought this would be a great time to share something about me you probably don’t know! I love to travel. We were fortunate to live overseas for 5 years. We tried our hardest to use this time to its fullest and visited 21 different countries! We were always on the go! We did thousands of miles of traveling with a toddler and elementary child in tow. Traveling with kids is often daunting. Making sure everything is packed and keeping kids entertained in an unfamiliar environment can be a monumental task, but the rewards are tremendous and well worth the effort! I love that my children see the world as small, nothing is out of their reach! We carried a special bag in our back pack with a few very small toys and activities that we traded out frequently. The only time we used this was at dinner time. We quickly found that many countries have a much slower paced meal time that was difficult for small children. This little bag of tricks kept them entertained so we could savor the meal. I also can’t say enough for children having their own pocket sketch book! Even a toddler can be encouraged to”sketch” their experiences! We learned the more open minded we as parents were and how eagerly we met new experiences the better our children reacted to new situations. From the first step off the plane we saw that the “need” for souvenirs would be great! We decided to choose one thing for each of us to collect. This was probably the best travel decision we ever made! One son collected ink pens. Usually the kind filled with water and moving objects. 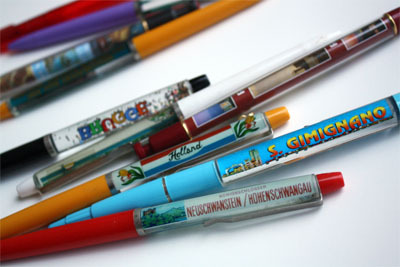 These at the time were readily available all over the world. The only requirement for the pen was that it said the place we were visiting. My brother has built my son the most amazing display case to show off all of the pens. It is fun to see this collection grow and grow. My other son, whom was a toddler at the time, started a postcard collection. We were worried that he would not remember most of these experiences, so for each place we visited we wrote a little about the day and mailed it home to ourselves. This was a simple way to keep a journal, with a built in picture and time stamp! As he got older we would have him write about the day, something we have continued into his teen years. 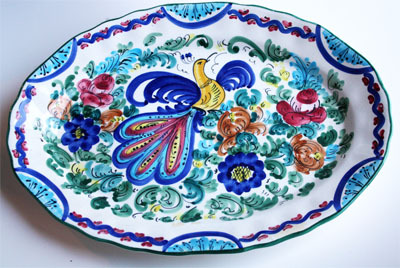 For my husband and myself, we collected beautifully decorated ceramic plates. Our wall of plates is now a focal point in our home. A simple walk through the room and a glance at the plates triggers a flood of wonderful memories! Do you have special tricks and tips about family travel? Please do share in the comments! Your kids might enjoy these fun games! 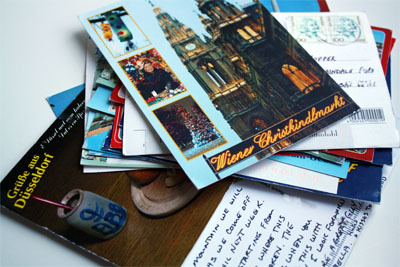 I have always collected postcards and Christmas ornaments. I do the same as you with the postcards in writing a blurb about my trip and mailing it to myself; but I want ideas on what to do with these postcards now that I've got quite a large collection! I used to have them clipped on a long piece of twine as a boarder around my room. I've considered framing them in a huge collage-type fashion, but I want to be able to read the backs. Any ideas on how to display a postcard collection?! We pack a vitamin/pill containr with small snacks for the little ones. They have to work to get a small snack by opening each container. It also keeps them guessing about which snack will come next, and if they spill it, no problem, clean up is easy!!! Playdough is my very best secret! The homemade kind though -- the storebought stuff dries out mid-flight. Those are wonderful tips! I especially like the postcard souviners. I LOVE that you wrote a little about your day on the postcard and mailed it to yourself. What a wonderful way for your children to remember your travels!!!! When my child was young we traveled through the US and Canadian National Parks. Back in the days when you could easily copy car keys, we would make a copy of the rental car key (less chance of us getting locked out) and my daughter would get to select a souvenir key chain for the key. We also purchased a christmas ornament each summer and dated it. To keep her occupied she also had a sketch book and special drawing pencils. When older she became the keeper of the species list, recording what we saw - where how many, etc, - a role that she took quite seriously. She is now in college and we still have her lists! Now I know why I keep seeing Polish Pottery dishes used to display edible goodies! We have lived overseas for the past 6 years - since the kids were 2 1/2 and 4. The kids tend to remember our trips based on the toys they played with. While I thought it was crazy to spend 1 or 2 euros in a gumball machine for little Winnie the Pooh figures in Sicily, they kept the kids occupied at every meal and other "slow" times. They remember Venice for the balloons shaped with who-knows-what-kind-of-powder that had eyes and could be shaped into funny faces. Oh my gosh Laurie, we bought those silly balloons (with who knows what inside) also while traveling overseas! I love the idea of collecting things! I started collecting post-cards and love that they remind me of the wonderful adventures I've had. We try to find a local artist or sketch of the place we visit. I frame them and keep them where I can remember our time away! For my son on our trip to Disneyworld we bought him an old world map from one of the exhibits he enjoyed and that is on his wall. With family living 1,000 miles away, traveling has been "the norm" for us. We also travel extensively for my husband's job. Whenever we travel somewhere new, we buy a Christmas ornament that specifies that place. It is always fun to set up the Christmas tree and remember the places we've visited. We often drive to our next destination, so we print out black and white US maps. Whenever we cross the line into a new state the kids color in that state. Then they open their individual notebooks, which I have loaded with printed games, coloring pages, etc. pertaining to each state we will travel through. Not only does this keep the trip "fresh" for them and help with boredom, they also have learned their geography quite well! I love the ideas you shared. Especially the writing notes on the post cards. Wonderful! I love these ideas! Whenever we travel, we collect Christmas ornaments. It's so fun to remember each trip as we hang the ornament on the tree each year! With family spread all over the country, we are often on the go. Plane travel has become our least favorite route. We are absolutely in LOVE with travel by train!! You get to see more of area you are traveling through/to and the people you meet on the train garner wonderful stories and friendships. We don't really collect anything, but I guess we should start! Our kids are 5, 5, & 3, but I have traveled with the kids, starting when the twins were 6 months. Before a trip I make a trip to the dollar store and get small trinkets and coloring books. When they were younger and one would start to have a meltdown (while on a plane or in the airport) I would pull out one trinket that I had wrapped in tissue paper. It was never anything expensive or fancy, but it was new and enough to distract them and keep the peace. We will soon delve into the wonderful world of international travel with our kiddos, how exciting!! I used to travel w/my two little girls for a 9-10 hr car ride every summer to visit relatives. There was always a "goodie box" in the back seat for each of them. Filled with all kinds of little activites. One item was a "starter booklet". I'd start a story, and they would fill it in as we took our trip, drawing pictures and all. Sometimes I'd write an ending and they'd write the rest. Another time they were the "navigator". They followed the map and indicated the spots where we would stop. They are both grown now, but we still talk about the trips and the "goodie boxes". Thanks for a walk down memory lane! Since we lived away from family,we did extensive travel and many outings when my children were young. Two things that worked for us...1) we had a hand held electronic game system that was ONLY used during our travels(flights, long rides in the car) and only for a limited time each use. They did not have such a system at home, so it was a real treat. They got to pick out a game before the trip. This kept them occupied well during traffic tie ups, or flight delays. 2)I would prepare "surprise bags" before hand. Small, easy to fit into nooks and crannies in our packs. They might contain a small snack, toy,book,or even a small amount of cash to be used as they wish. I would pull these out as rewards for good behavior, a kind deed, or at random times when I "caught" them acting appropriately, etc. The randomness of these being given added to the mystery. Just be careful not to reward the wrong behavior(ie,using one to stop whining)! Of course, when we reached our destination, all items got packed away,except cash,snacks and water, since we expected the focus to be on the destination, once reached. When I have better light I will take a picture of all the plates on the wall and my son's pen holder, you will be amazed at my brother! Just a comment about the postcards (because it is my favorite collection). These postcards are the sweetest. There are over a 100 with funny quotes from my son, special things we did and a visual diary of how his handwriting has changed. I am not a person who keeps a scrapbook or journal --- so these are a perfect record! Wish I would have thought of the pen idea! We just collected rocks, magnets, and any other chotchky item sold at the local gift shop. Postcards go without saying. Also, especially love the plate idea!! We traveled a lot when our kids were between 0-5 years old and they traveled very well. The trick for me? Yes, the bag of small toys and puzzles and such are good for a while, but also (and this still works today), know that anything can be a new toy! When in a restaurant, make an oragami cup from the napkin or the paper placemat and give it to them, draw a game board on the back of the placemat and use sugar packets as game pieces, chop sticks make great dolls if you draw faces on them. I would give my kids the "extra" stuff on the table (like the little container the sugar packets come in... spill them out and ask the baby to put the sugar packets back in) These things entertain for hours. Now that they are older... one word... Nintendo DS. Babysitter and child entertainer for HOURS. I absolutely love the idea of each child collecting the same thing everywhere they go. Fantastic! The collect thing is the greatest idea! As a family we collected magnets, small cheap easy to take home. But then guess what? We don't have a metal fridge anymore...! Where to put all the magnets?? In a box somewhere HOW BORING! Oh Carissa, I think a large sheet of metal hanging on the wall would be a cool way to display those magnets --- a fun art installation. When I travel I try to find a local artist and buy a piece of their work. That way I can remember the trip and add a touch of flair to my home. I have collected paintings, glass blowings, pottery, wood carvings and can't wait for my next adventure. My husband and I moved five times this past summer (within the continental US) when our son was between 6-9 months of age. It was exhausting so an overseas adventure is probably not in our near future! I think open mindedness and flexibility are definitely key like you said. One thing that we like to do is to find ornaments (or souvenirs that we can turn into ornaments) at each place that we travel to, so that at the end of each year when we hang them up on our tree, we can reminisce about all the adventures we've had over the years. Our family collects cookie cutters from our travels...our children love to make cookies and remember where we've been. I am loving these ideas of different things to collect! Thanks everyone for sharing!